Another installment of what Leanne googles on her phone and dreaming she had lots of money! 2. Wifey Sweatshirt from Malcolm and Gerald. This is swoonworthy and comfy, all at the same time. Throw this on with some skinny jeans and fit for a walk in the park with the terrors, I mean kids. 4. Floral bedding from Dunelm - I've had a bee in my bonnet about updating the decor a touch to embrace the sunshine and happiness. Love this pretty pattern with a dash of colour. 5. Floral bedding from Asda - and the pretty delicate pattern on this one, Not sure how the husband will feel about all the pretty bedding!! 6. Monogram scatter cushions from Next - Yes I am still on my cushion - and anything with a monogram is all good for me!! 7. Superhero bedding from Dunelm - in my bedding hunt I cannot forget the little ones of our house. However I think the husband would also be quite happy with these ones. 8. Dinner service from Wilkos - My husband is on a mission to break all the dinner plates in our house. We have one white left and two random plates. This is not acceptable and I need a full set. This looks good value. 9. Finally Sandals from Asos - yes the sun is out and I then need to find work acceptable summer shoes which are not flip flops. This have a nice pop of colour and look to be comfy. 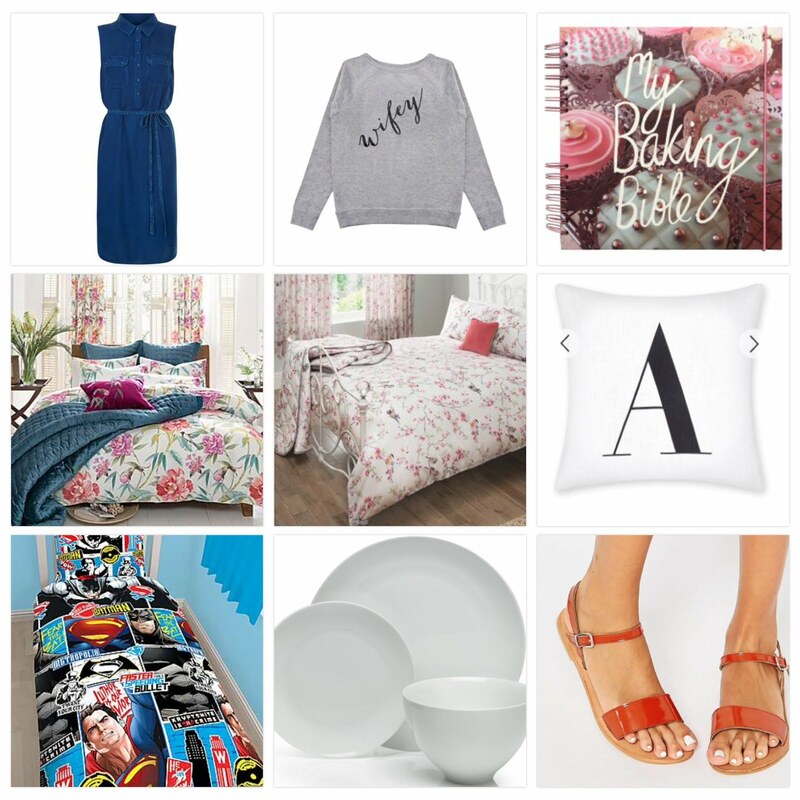 Lots of pretty things in my search history.... whats on your wish list?